We're really sorry, but this product is temporarily out of stock. Hopefully it won't be long before we can get it back, but until we do, we believe that our Blackcurrant Glycerin Swabsticks 3x25 could be a good alternative. I've read these can be both dessicating &/irritating so are they suitable for use when a person can no longer swallow? Also, if the person can't swallow, surely you don't want to stimulate production of saliva? I'm asking because palliative care nurse recommended them. should I keep the box of lemon glycerin swabs regrigerated? These should be stored in a cool dry place away from heat & direct sunlight. 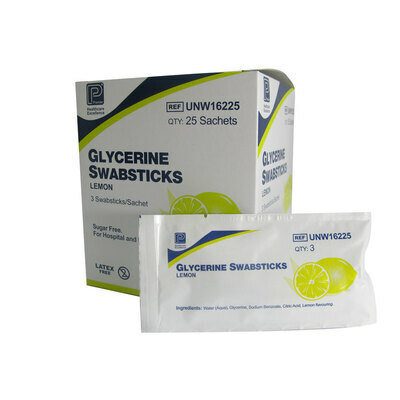 Essential to the dental industry, these Lemon Glycerin Swabsticks come in a handy triple back of 25. Developed for use by medical professionals, they are ideal for stimulating saliva production in patients and work to soften the oral tissues for appropriate procedures. Containing a mix of glycerine and citric acid, they come individually wrapped for hygiene and can be stored until required making them an efficient resource to have on hand. We stock a range of additional patient healthcare supplies including Tongue Depressors 100 and Bandages in our First Aid & Medical Supplies category.